As much as we all love our favorite bands and the rock stars who compose them, it's easy to become jaded or disillusioned about who those individuals might be as people. Eddie Vedder in particular is very fond of his "P-R-I-V-A-C-Y." In our minds they become almost mythical characters, not real people who are in touch with the world. Then you read a story like Jennifer's. 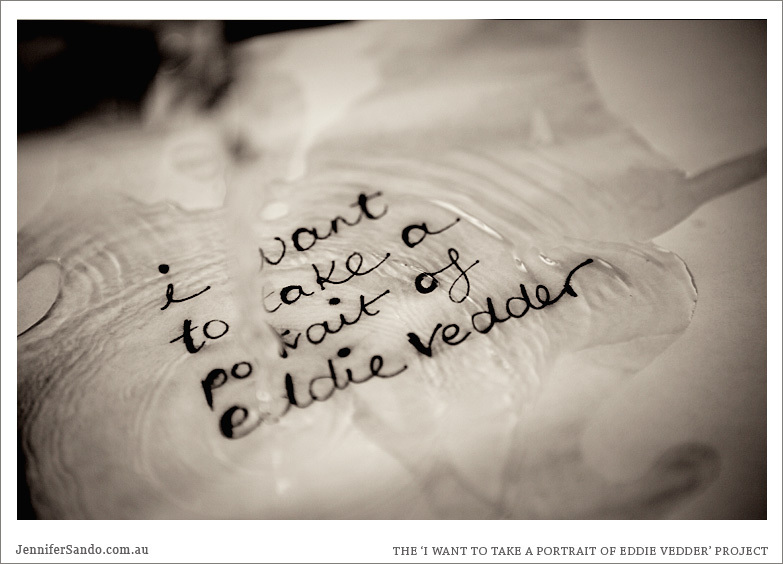 As a long time Pearl Jam fan, her goal was to take a portrait of Eddie. This may seem almost laughable at first, especially considering she's an Australian who had no plans to visit Seattle anytime soon. Despite the numerous barriers that most of us would see between her and her goal, she launched her online campaign; "I Want To Take A Portrait of Eddie Vedder." By the time I caught wind of the campaign, Jennifer had already accomplished her original goal and set a new one! She began a kickstarter.com project in an effort to raise enough money to do an initial print run of a book that would detail her quest for the Eddie Vedder photo shoot. I was happy to "kick in" and was glad to see a lot of other Pearl Jam fans from all over the world were eager to support her as well. When I received my copy I was instantly impressed with the quality of the photography and the design choices for the book. This is something you'd be very proud to put on your coffee table. I found that I went through the book three times. The first time, I just turned the pages and checked out all the pictures. The second time, I read every word (can be done in about 15 mins), and the third time I just slowly went back through and appreciated the journey that Jennifer took, and the result she achieved. Not only did she achieve the impossible by getting the attention of the band and successfully booking time with Eddie Vedder in Australia, but she also managed to paint a very human picture of Ed as a person. She remarks that when they met, he was so focused on what they were doing that she thought it was as if Ed had campaigned for months to meet HER! He came to the shoot prepared with a prop and ideas, was gracious to her family, and even stayed longer than the allotted time. You close the book feeling reminded of why you love Eddie and Pearl Jam in the first place. It's all about the people they are, the music they create, and the community we've all helped build. 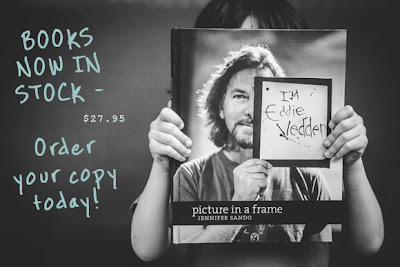 If you're an Eddie Vedder fan, or just like great photography, you should check this book out. I'd like to thank Jennifer for sharing her experience with the rest of the #PJFAM.